Flexible Form Earthbag Construction showing how to build a dome. 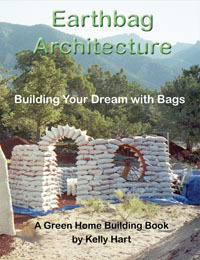 Fundamentals of constructing a false/corbelled dome in earthbags. The focus of this workshop was building in a way that connected the structure and the people to the energy flows of the universe. Stella reminded participants to use all of their six senses to touch, listen, taste, smell, see, and intuit their surroundings. Extra care was taken to build this dome as a living structure with breathable walls and natural waterproofing and plasters. The building will serve as a meditation dome and was built with a mix of raw earth and scoria rock. Lime was used as a stabilizer in the foundation and stem walls. The exterior plaster is cob made from a mixture of horse manure, clay, and sand which will be finished with a thin lime plaster for water proofing. 18 participants built the 2.5 meter (8ft) dome during the 5 day course. Participants ranged from 21-60+ years young and covered multiple states in Mexico. Participant's backgrounds were architecture students, engineers, artists, permaculture educators, indigenous organizers, teachers, construction workers, a Haiti relief organizer, and people interested in esoterics and sacred geometry. We are building an Earth Bag Home made of poly bags, old tires, bottles, and adobe in Garfield, Arkansas. This video shows the importance of soil testing for filling the bags. Paul made the choice to not use the soil from the home site but instead chooses to fill the bags with crushed limestone. He feels it will be faster and more efficient because the limestone packs like concrete and is inexpensive. We paid less than $7 for one ton. Evan (Lisa's son) & Sarah, Scott & Tanya Smith of Turpentine Creek Wildlife Refuge (good friends), and Wanda (Paul's mother) all share their thoughts on the Earth bag structure and how that affects the environment, financial considerations, and recycling aspects of building this type of home. Paul and Lisa Majors are building an "Earthbag Home" in Garfiled, Arkansas made of crushed limestone gravel, poly bags, old tires and other recycled materials. So far they are up to the 4th row of filling the bags and getting closer to their dreams of having a house paid for before it is finished. The main dome is 25' while the new addition of another dome is 18' in diameter. A connecting hallway will join the two domes and allow for a small garden area. This is a 15 minute film on earthbag construction at ‘Green Resource Center’ in Karamoja, Northern Uganda, as a part of IOM’s Karamoja Food Security and Community Stabilization Programme. Watch us build an Earthbag House in Fairbanks, AK in time lapse. This 9-day dome workshop in New Zealand shows the entire process from start to finish.